Rehabilitating a 321-year-old bridge – the oldest structure still in use in America – is no easy task. 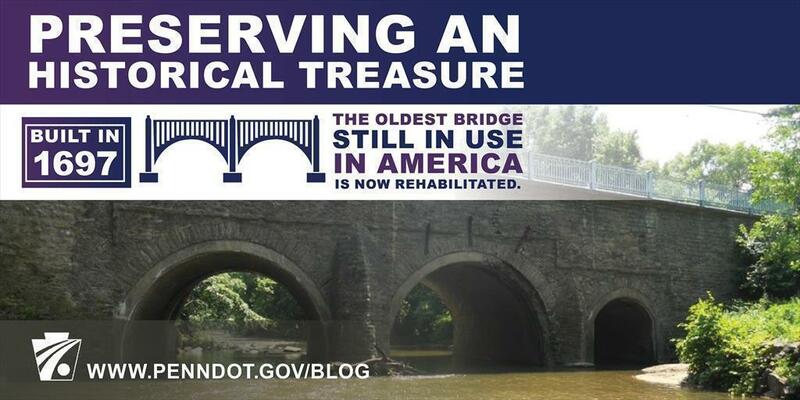 Yet the rehabilitation of the bridge carrying Frankford Avenue over Pennypack Creek in the Holmesburg section of Philadelphia will forever be a part of its storied history. Built in 1697 and reconstructed in 1893, this three-span stone masonry arch bridge is listed on the National Register of Historic Places. It was an important link on The King's Highway, which eventually connected Philadelphia to New York. Some historians believe George Washington and John Adams crossed the bridge. "The longevity of this bridge is truly amazing; it's an engineering marvel," said District 6 Executive Kenneth M. McClain. "With this rehabilitation, the bridge could see its 500th anniversary, which is a real testament to PennDOT's commitment to historic preservation." The impetus behind this bridge rehabilitation stemmed from an inspection of the structure following a 2015 crash when a section of parapet wall was damaged. "These types of bridges are very susceptible to freeze-thaw cycles, and the bulging in the north spandrel wall was getting to the point where corrective measures were needed," said Mike Cuddy, senior vice president with TranSystems Corp., the designer for the project. "This project represents a proactive approach by PennDOT." Crews removed and rebuilt the bridge's north spandrel wall; excavating and replacing arch backfill; repointing stone masonry; and performing other activities. Loftus Construction, Inc. was the general contractor on the project. To move the project from design to construction took long hours and much collaboration. Cuddy, along with Meg Sherman from TranSystems, Inc., Monica Harrower, PennDOT District 6 Cultural Resources Professional, and AECOM Consultant Project Manager Kristin Caparra worked tirelessly to make this rehabilitation a reality. Similar work has been successfully completed on 65 other masonry arch structures in the Philadelphia region, but none this old. Giving new life to an old bridge like Frankford Avenue is truly a labor of history. Watch the Frankford Avenue Bridge ribbon cutting below. For more information on projects occurring or being bid this year, visit www.projects.penndot.gov.